Leading experts will find the most appropriate measure to make Con Son stream have water all year round. 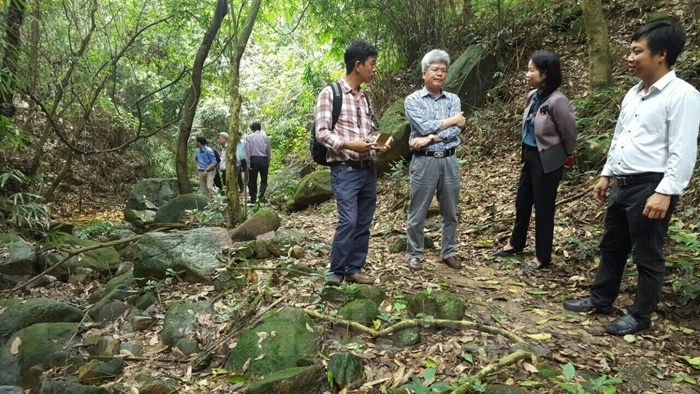 The Ministry of Science and Technology, the Hai Duong Department of Science and Technology, and the Management Unit of Con Son - Kiep Bac Relics on March 21 morning surveyed and researched on restoring the flow of Con Son stream. Work construction or impacts causing the loss of the current natural landscape of the relic site is absolutely not allowed. Research and planning to restore the flow of Con Son stream began in May 2018. The project will be carried out right within this year. Con Son stream, 3km long, originates in spring water at the top of Con Son and Ngu Nhac mountains. Previously, there was water all year round; however, Con Son stream has gradually had water only during the rainy season due to the occurrence of six broken points.